In fry pan or Dutch oven, brown the ground beef with some salt and black pepper to taste. Be sure to get lots of deep brown bits on the pan because these will lend your chili a rich beefy flavour. Add the onion and green pepper and fry until they start to soften. Add the tomato sauce, beans, and all of the spices. Bring to a light boil and then simmer on low, stirring occasionally, for an hour and a half to two hours or until the kidney beans are cooked through. Serve topped with a sprinkling of sharp cheddar and a dollop of sour cream. 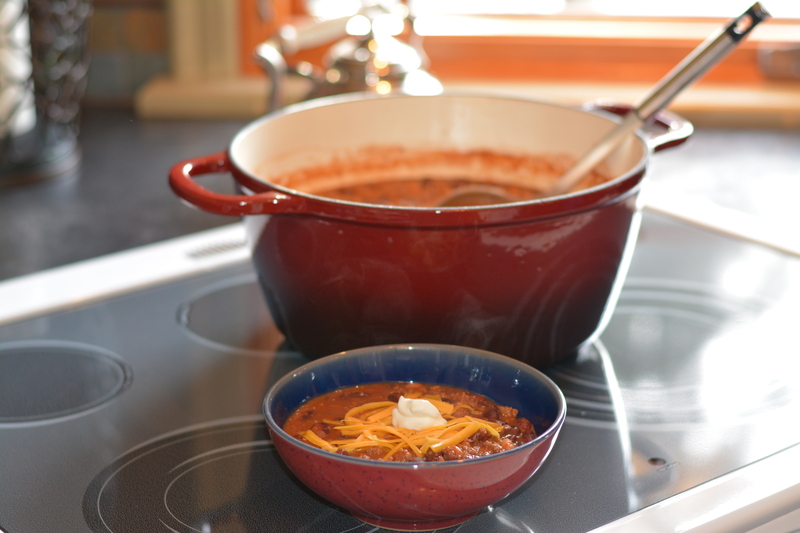 This entry was posted in Lunch and Dinner, Recipes and tagged best chili recipe, chili con carne, chili with meat, dutch oven recipe, GF, gluten free chili, gluten free in Red Deer, Gluten-free diet. Bookmark the permalink.